"Would I counsel, necessarily, a preemptive strike on Iran? I'm not sure. I would be very careful about that." While Lobe has already masterfully laid out the ignorant assumptions, egregious lies, hysterical hasbara, and shameful bellicosity of Netanyahu's performance, it should also be noted that, when it comes to trying to bully the United States into setting "red lines" or even perhaps initiating a war of aggression, thereby committing once again - in the words of the Nuremberg Tribunal - "the supreme international crime," Netanyahu has not only issued alarmist predictions about ever-imminent Iranian nukes for over twenty years, but has stuck to the same exact script for a decade now. Of course, as we all know, then it was Iraq and now it is Iran. In his frenzied and frustrated warmongering efforts, Netanyahu has apparently forgotten to come up with some new zingers, instead hoping that what worked for him in 2002 would work again in 2012 (spoiler: it won't). "[I]t is simply not reflecting the reality to assume that Saddam isn’t feverishly working to develop nuclear weapons, as we speak." "Today, the regime in Iran openly calls and determinedly works for our destruction. And it is feverishly working to develop atomic weapons to achieve that goal." "How imminent is it [the threat from Iraq]? Look, do you want to wait and find out? The answer is no." "The world tells Israel, 'Wait, there's still time,' and I say, 'Wait for what, wait until when? '...The fact is that every day that passes, Iran gets closer and closer to nuclear bombs." "[Iraq] happens to be one of the two - now, as we know, one of the three - regimes that is racing to build nuclear weapons." "And for me, the issue is, as the prime minister of a country that is threatened with annihilation by a brutal regime in Tehran that is racing to develop nuclear bombs for that and, obviously, we cannot delegate the job of stopping Iran if all else fails to someone else." "Make no mistake about it, if and once Saddam has nuclear weapons, the terror networks will have nuclear weapons." "A nuclear-armed Iran would dramatically increase terrorism by giving terrorists a nuclear umbrella." "Today the United States must destroy the same regime because a nuclear-armed Saddam will place the security of our entire world at risk." "For fifteen years, I’ve been warning that a nuclear-armed Iran is a grave danger to my country and to the peace and security of the world." "Every indication we have is that he [Saddam] is pursuing, pursuing with abandon, pursuing with every ounce of effort, the establishment of weapons of mass destruction, including nuclear weapons." "Come on. We know that they're working towards a weapon. We know that. It's not something that we surmise. We have absolutely certainty about that. And they're advancing towards that nuclear program." "There is no question whatsoever that Saddam is seeking and is working and is advancing towards the development of nuclear weapons — no question whatsoever." During a March 7, 2012 interview on Fox News, Greta Van Susteren asked Netayahu about the case for illegally attacking Iran in light of what the world now knows about the lies that led to the invasion of Iraq. "Do you have any doubt they [Iran] have a nuclear weapons program?," Van Susteren wondered. 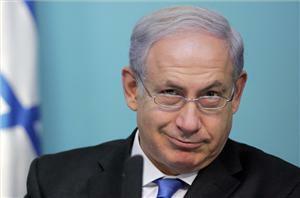 The Israeli Prime Minister replied: "I think there is no question." Van Susteren continued, "[I]n 2003, with weapons of mass destruction in Iraq, there was so much certainty and it turned out, our intelligence was wrong on that. So I am trying to balance the two." "First of all, there is no question. There is no comparison. In the case of Iraq, I was on the Israeli cabinet when we discussed this issue. We didn't know. We couldn't say that they didn't have a nuclear weapons program, we couldn't say if they did. In the case of Iran there is absolutely no question." September 27, 2012 - Speaking at the UN General Assembly today, Netanyahu continued to recycle the same propaganda about the never-ending Iranian quest for nuclear weapons. "[J]ust imagine Iranian aggression with nuclear weapons. Imagine their long range missiles tipped with nuclear warheads, their terror networks armed with atomic bombs." "[Saddam] no longer needs one large reactor to produce the deadly material necessary for atomic bombs. He can produce it in centrifuges the size of washing machines that can be hidden throughout the country. And I want to remind you that Iraq is a very big country. It is not the size of Monte Carlo. It is a big country. And I believe that even free and unfettered inspections will not uncover these portable manufacturing sites of death." The red line must be drawn on Iran's nuclear enrichment program because these enrichment facilities are the only nuclear installations that we can definitely see and credibly target...Do we want to risk the security of the world on the assumption that we would find in time a small workshop in a country half the size of Europe?" "Netanyahu's remarks during the 2002 congressional hearing sounded very similar to his UN speech. The arguments are the same, the intonation is the same, even the advisers are the same – Netanyahu’s current diplomatic adviser, Ron Dermer, who wrote the prime minister’s UN address, can be seen in the 10-year-old video sitting behind Netanyahu in the congressional hall. " Ravid - who gives due credit to journalist Jim Lobe to unearthing Netanyahu's 2002 Congressional testimony - astutely adds, "Aside from the fact that both Dermer and Netanyahu look 10 years younger, the primary difference between the two videos is one word: 2002’s Iraq has been replaced by Iran in 2012." Even though I already covered this ground two weeks ago, it's certainly a positive development to see this information making it into the mainstream press (well, mainstream Israeli press, at least, where such discussion of these issues is often far more open and illuminating than here in the US). Unfortunately, Ravid is still beholden to quite a bit of misinformation regarding alleged "Iran’s nuclear ambitions," which he claims "are real and a serious problem" as he believes they demonstrate Iran's "desire to acquire nuclear weapons," despite the fact that there is no evidence to back up this allegation. Ravid even cites IAEA reports as proof of such dubious "ambitions," which unfortunately shows that even seasoned and well-connected reporters (perhaps them most of all) are prone to alarmism rather than understanding the facts. As has been pointed out by Gareth Porter and others, the IAEA has reported that Iran has converted roughly half of its medium-enriched uranium (~20% enriched) to fuel plates, an technological advance that prohibits that uranium from being enriched further towards weapons-grade, thereby substantially reducing Iran's capacity to "breakout" towards weaponization. When data in the Aug. 30 IAEA report on the "inventory" of 20-percent enriched uranium is collated with comparable data in the May 25 IAEA report, it shows that Iran is further from having a breakout capability than it was three months earlier. "Nobody has put out the story that their stockpile is shrinking," Porter quotes nuclear proliferation expert Joe Cirincione as saying. Earlier this year, Paul Brannan, an analyst with the Washington D.C.-based Institute for Science and International Security (ISIS), told reporter Laura Rozen that the Tehran Research Reactor which will be powered by the nuclear fuel plates Iran has produced "is used not for any weapons purpose, but for nuclear medicine, to treat Iranian cancer patients." Iran's production of fuel for a research reactor from 20 percent enriched uranium is not insignificant. Instead, this action, combined with Iran's use of low-enriched uranium for production of fuel for its power reactor, and the intent to continue both, eliminate any hypothetical threat of a nuclear weapon from Iran's fully safeguarded nuclear programs. The United States and its allies should support these actions and end dangerous threats and sanctions against Iran’s important nuclear programs. Glenn Greenwald recently pointed out that the real fear over the Iranian program (embodied perfectly in Ravid's handwringing over Iran's monitored, inspected, and safeguarded facilities) is that "Iranian nuclear weapons would prevent the US from attacking Iran at will, and that is what is intolerable." Actually, it is no secret that what scares advocates of eternal American (and Israeli) hegemony over the entire world most is the prospect of not being able to invade, occupy, overthrow bomb, blockade and murder at will. In his December 2011 call for the United States to soon launch an unprovoked attack on Iran, Matthew Kroenig wrote in Foreign Affairs that a "nuclear-armed Iran would immediately limit U.S. freedom of action in the Middle East. With atomic power behind it, Iran could threaten any U.S. political or military initiative in the Middle East with nuclear war, forcing Washington to think twice before acting in the region." What makes the Iranian nuclear conundrum an issue of international significance isn't really the possibility of Tehran acquiring a nuclear warhead to purportedly wipe out the state of Israel from the face of earth. This narrative - most aggressively forwarded by the Benjamin Netanyahu government and his hawkish allies in the West - is primarily a propaganda exercise to intensify international pressure on the Islamic regime. First of all, there is a consensus among all major Western intelligence agencies - including Israel's own security establishment - that Iran has not made the decision to develop nuclear weapons. Crucially, Iran has neither established a decision-making structure around a prospective nuclear weapon program, nor has it developed a credible delivery system. Second, Iran will be shooting itself in the foot if it develops a nuclear-weapon capability, because that will eliminate its regional conventional superiority once weaker neighboring states start to develop their own nuclear deterrence in response. Most importantly, Iran will stand no chance of survival if it decides to target Israel with nuclear missiles, given the latter's superior stockpile of nuclear warheads (and rapidly-advancing second-strike as well as pre-emptive nuclear strike capacity). In an event of an (impending or actual) Iranian strike on Israel - directly or through surrogates - America will not hesitate to 'wipe-out' the Iranian regime to protect its most vital regional ally. So, the Iranian nuclear issue is fundamentally about the balance of power in West Asia. Israel is essentially concerned with the emergence of a "virtual" - possessing a "break-out" capacity to develop a warhead on a short notice - nuclear-armed state in Tehran, eliminate Israel's regional nuclear monopoly. This would undermine Israel's four decades of strategic impunity to shape the regional environment to its own liking. Thus, it is crucial for Israel to prevent any Iran-West diplomatic compromise, which will give Tehran a free hand to enhance its regional influence and maintain a robust nuclear infrastructure. As always, you explain your case eloquently. I think you miss two very important points. First, The US thus far has resisted the pressure to "draw a red line". I think this is very important as the political pressure must be overwhelming for Obama to go ahead, draw the red line and avoid looking week in an election year. Even more importantly, what people must understand, is that a red line would be a commitment to war with no wiggle room. The second point is that the view of the people of the three countries involved could not be more different than the governments of each. Do average US citizens want another war? No. Only the extreme right/neo-con thinks this sounds like a good idea. Do the people of Israel? No. Netanyahu represents, as he always has, the extreme view and I think will lose power very soon. Do the Iranian People want a war? Specifically with the USA? No. The Iranian people as a whole probably have the most pro US view of any Arab nation. Who want's this war? People who will profit from it. Thanks for the comment; I think everything you've written is correct except one thing: Iran isn't an Arab country. Just something to keep in mind. Thanks for the correction. I do consider myself pretty knowledgeable on any topic I choose to comment on and did know that they are of course not part of the Arab League. The US news lumps all Middle East Countries together. That is a massive diss-service to all, one which I do not wish to contribute to. So I sincerely thank you again for correcting my mistake. Great piece Nima. Submit it somewhere with a wider audience and readership. I recently wrote about Netanyahu's 2002 claims about Iran as well...but I wish I'd known about his jarring statement to Van Susteren when I did. That's a great find that really puts the exclamation point on the case against his credibility.